Well, once again I made the trek out to the point on Tybee North Beach with my friend Russ Wigh. 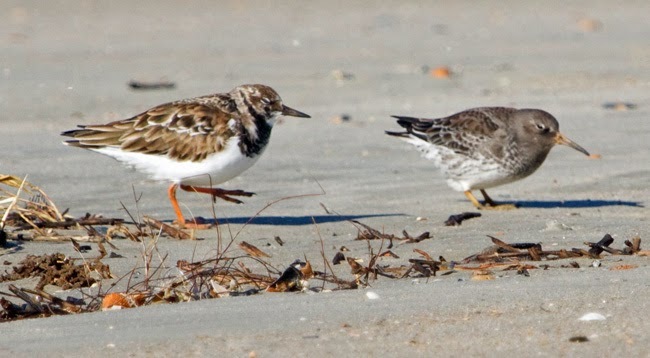 Russ was in search of a Purple Sandpiper. 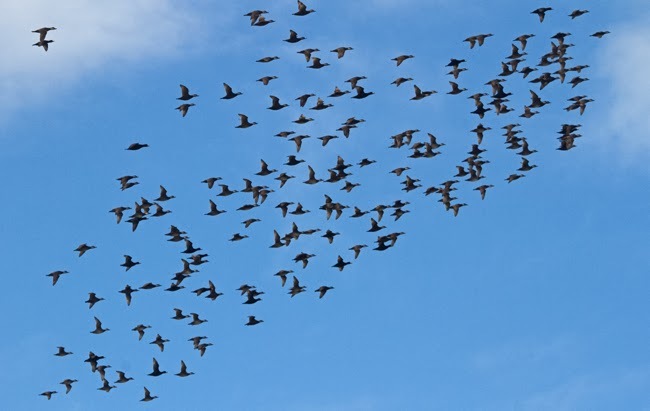 The birds were all huddled up in tight groups facing into the 20 mph northeast wind. At first, we saw a group of Ruddy Turnstones, Dunlins and Sanderlings, but no Purple Sandpiper. 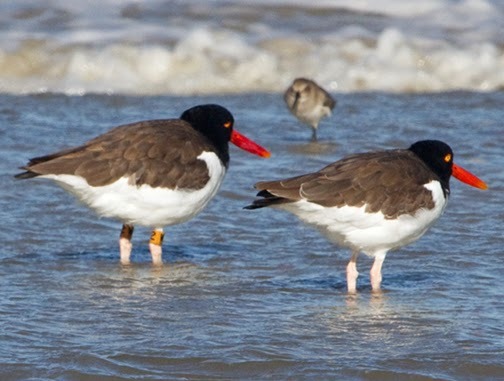 We inspected American Oystercatchers for bands (found Yellow N4, Yellow W4 & Black UO). Just as we decided to stop fighting the wind and head back, I glanced at a group of small shorebirds that had been startled out of their huddle. Their it was - a lone Purple Sandpiper! How many species do you see? By the jetties, we found nothing but Double-crested Cormorants, Brown Pelicans and the usual gulls. Russ and I went on to Ft. Pulaski where I suggested we check the picnic area for Brown Creeper. I played the call and we heard a high-pitched response. 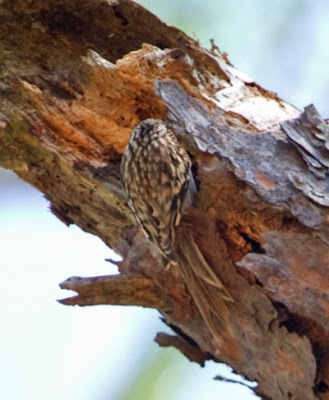 Soon Russ spotted the creeper doing its thing on a pine tree above us. 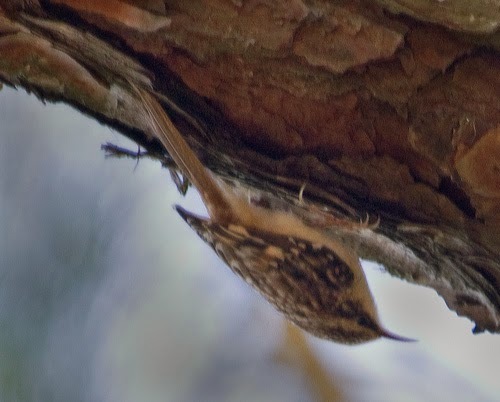 Later I found that there were 2 Brown Creepers in the neighborhood. Other treats at Fort Pulaski: a Loggerhead Shrike and a flock of Eastern Meadowlarks. Not bad for a blustery day! Had to get out on the beach the last two mornings to take advantage of extra high tides. Northeast winds were blowing 15-20 mph making for some cold, blustery conditions. Yesterday's highlight was my first of the season Purple Sandpiper. This was early for me to find one on Tybee as they generally show up about the third week of November. I did not see the bird again this morning. 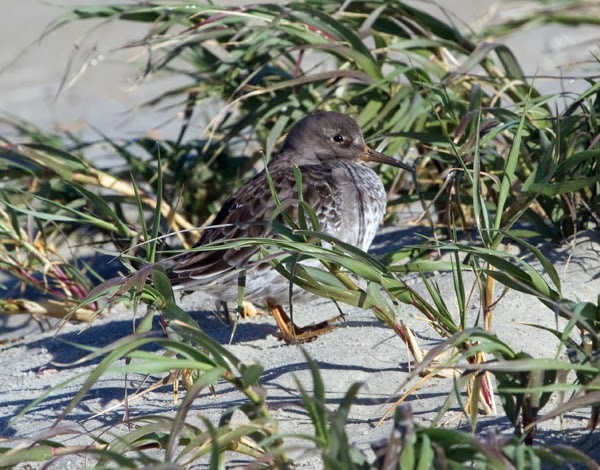 First of the season Purple Sandpiper trying to hide from wind. There was a flock of about 60 American Oystercatchers with some banded birds. My regular Yellow N4 was there, as was Black UO. I saw returnees Orange W2 and Yellow W4 for the first time this fall. Orange W2 was banded at Hereford Inlet NJ 4/25/08. 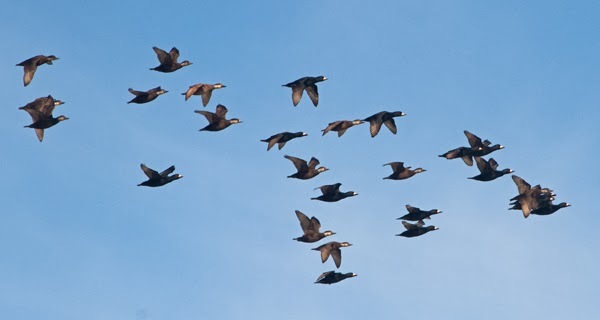 This morning, before I even got to the beach I was thrilled to see a large flock of black scoters fly by coming from the direction of Lazaretto Creek and heading around the north end of Tybee. During the 2 hours I was there, several thousand scoters flew by. All the flocks I saw were black scoters, not lesser scaup. 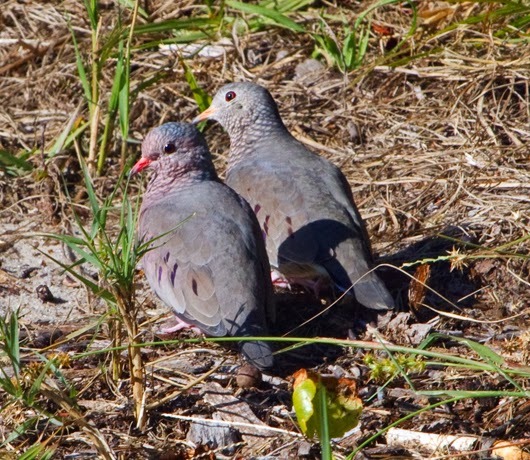 Easy to pick out the males and females in this photo. 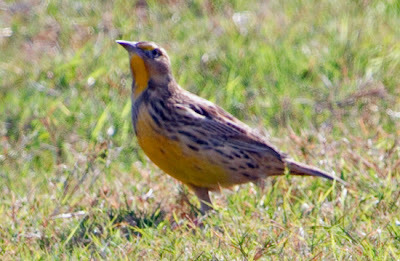 Yesterday I found three Eastern Meadowlarks in the grass by the small pond just off the beach. Today was even better. There was a pair of common ground doves hanging out in the grass near the gazebo. 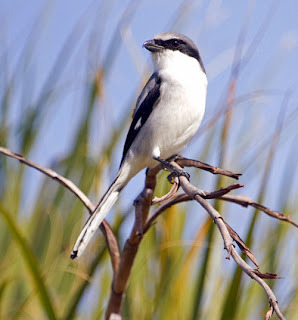 I rarely see these birds in Chatham County. 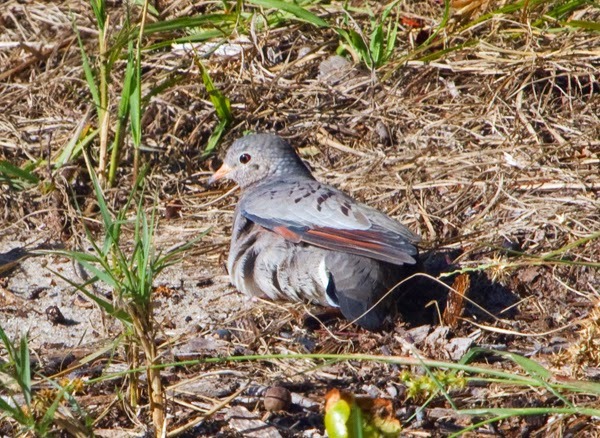 Common Ground Dove fluffed shows rust in the wing. Later, when I stopped at the Community Center to vote, a male Northern Harrier soared over Jaycee Park. It was a great blustery day on Tybee Island!